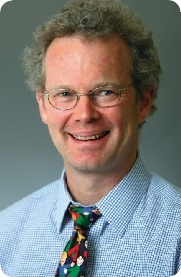 One of the Public Health Advocacy Institute’s founding board members, Ben Kelley, is a longtime auto safety expert with considerable experience with the issue from both in and outside of government. He has just published an op-ed in the Los Angeles Times (and Fair Warning) that benefits from his long memory of General Motors’ apologies and promises made to Congress over nearly a 50-year span. It puts GM’s failure to recall its defective ignition systems in a new and especially unflattering light. It also describes the difference in regulatory interest from Congress in 2014 as compared to 1966. The commercial for Verizon’s NFL Mobile app begins with a noisy, crowded stadium and flashing camera lights. The quarterback calls out a play and makes offensive adjustments, and linebacker Clay Matthews counters by calling out his own defensive adjustment. The ball is hiked and handed off to the running back. Players run through a crowd of cheering fans on the field of play and then Clay Matthews lays a crushing tackle on the running back, jumps up, and flexes. A voiceover comes on and states “Never be far from the game. Download NFL Mobile and watch live NFL games exclusively from Verizon. Never be without football.” During these few sentences the commercial cuts to a quick scene, about one-second in duration, of a man and a woman in a car. She leans from over him, from left to right, and shows him the live action football play that just unfolded on her mobile device. To most, this one-second visual of the man and woman in the car would not evoke much thought. But when looked at in the context of Verizon’s corporate responsibility pledge to eliminate distracted driving, the innocuous clip becomes somewhat more concerning. Verizon boasts to have taken the pledge to eliminate distracted driving by partnering with Sprint and T-Mobile to promote AT&T’s “It Can Wait” campaign. The essence of the campaign is to raise awareness of the dangers of distracted driving. It also advocates that drivers take the pledge to refrain from texting and driving so as to eliminate distracted driving, making the roadways a safer place for all who use them. Texting and driving is a major public health concern as the combination of the two creates a 23 fold increase in the chance of getting into an automobile accident. In his blog post describing Verizon’s contribution to the campaign, Jack MaCartney, the Director of Corporate and Community Responsibility, acknowledges “Taking our eyes off the road, our hands off the wheel, to send or read a text, email, comment, post, tweet, is an unnecessary risk.” While Verizon’s efforts to call attention to the dangers of distracted driving are commendable, the commercial described above indicates that Verizon may not be as in touch with its distracted driving campaign as it claims to be. The Verizon spot is reminiscent of a Beck’s Beer commercial that was cited and sanctioned by the FTC for violations of the FTC Act involving the combination of beer and sailing. The commercial depicted a number of passengers on the boat with a large bucked of ice containing bottles of Beck’s Beer. Almost all of the passengers held bottles of beer, with one passenger standing dangerously close the bowsprit, others sitting on the edge of the bow, and none of passengers wearing life jackets. The issue the FTC had with the commercial was that the advertisers depicted boating passengers as drinking Beck’s Beer while engaged in activities that require a high degree of alertness and coordination to avoid falling overboard. In its complaint the FTC stated that as many as one-half of all boating fatalities are alcohol related, including an average of 60 recreational boat fatalities annually from falling overboard while drinking. Also it the its complaint, the FTC acknowledged that the company may be in violation of the Federal Trade Commission Act, the Beer Institute’s own Advertising Marketing Code, and federal and state boating safety laws. The After its investigation, the FTC concluded that Beck’s had violated the FTC Act with this advertisement and were sanctioned with strong oversight by the FTC of future advertisements involving alcoholic beverages and boats. Verizon’s commercial is arguably similar to the sanctioned conduct of Beck’s Beer. Like the Becks commercial where it was only the passengers drinking while on the boat, the passengers in the car are engaging in activity that poses a public health hazard. The FTC did not make the distinction between passengers and driver in its citation of the Beck’s commercial. Additionally, like the Beck’s commercial, the NFL Mobile commercial promotes activity that is prohibited by law in many states, i.e. using mobile devices while driving. 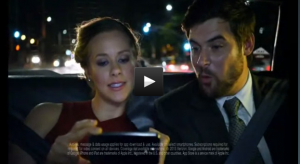 Verizon could have omitted the passengers being in the car and put them somewhere else where the passenger has a further removed from being the driver, such as in a bus or in the subway. While Verizon most likely did not make the commercial with the intention of promoting unsafe behavior, the company was at best oblivious and at worst careless in its production of the commercial. Verizon should take care to ensure that all forms of media use while driving are eliminated, not just texting, as they all increase the risk of injury and death. The company should be more and aware and sensitive to the messages it promotes in its commercials concerning mobile media and the dangerous implications they may have. A new Coors Brewing Company television advertisement called “Mutant Can” shows two scientists in a lab trying to find a way to improve the design of the Coors Light beer can. They then are shown in a movie theater watching The Wolverine (2013) and are inspired to improve the can by adding an “adamantium claw defense system”—a reference to the Wolverine’s special powers. The advertisement features clips from the upcoming movie. Beyond the unimaginative dialogue and choppy editing one is left wondering: Why is a beer company using a PG-13 movie based on a popular comic book to promote its beer? And hasn’t Coors made this mistake before? In 2003, just one month after alcohol marketers agreed to advertise only in media that targeted adult audiences, Coors Brewing Company sponsored Miramax’s PG-13 rated Scary Movie 3 (2003). Coors Light produced a Scary Movie-themed television advertisement urging viewers to keep an eye out for the “Coors Light Twins” during the movie. The advocacy group Alcohol Justice (formerly the Marin Institute) mounted a “Scary Beer Ads Campaign” against Coors’ youth-targeted marketing that ultimately ended Coors’ future plans for an advertising tie-in with Scary Movie 4. 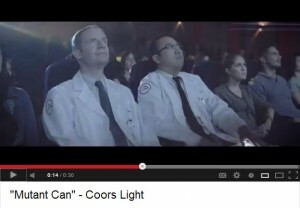 Coors Light is first on the list of the film’s promotional partners on the film’s official website and links to the Coors Light Facebook page (pictured below). 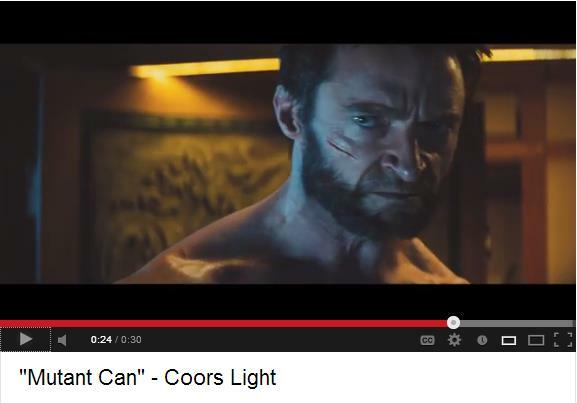 Coors produced the “Mutant Can” television commercial and publicizes its partnership with the movie on its Facebook page. 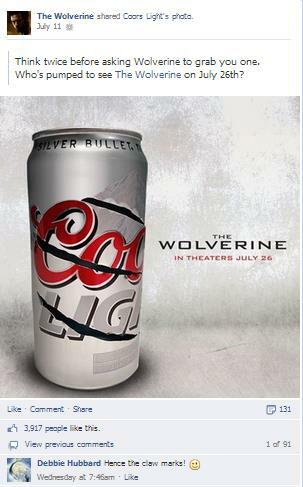 In turn the Wolverine shared a picture of a shredded Coors Light beer can from the Coors Light Facebook page with its Facebook fans, though the post was hidden from declared under-21 Facebook users in the United States. Coors’ obvious targeting of an under-aged audience is evident in the company’s choice to advertise through a popular comic book character. Logan, the Wolverine’s human alter-ego, is known to have struggled with alcohol abuse despite the fact that he is a mutant who possesses animal-keen senses, enhanced physical capabilities and a healing factor that allows him to recover from virtually any wound, disease, or toxin at an accelerated rate. The metal alloy adamantium bound to Logan’s skeleton makes him almost indestructible. 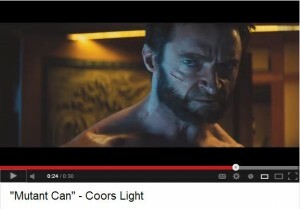 Coors Light developed the slogan “Adamantium meets aluminum” to connect Logan’s drinking and indestructibility to Coors Light beer for a young audience. This campaign fits with Coors Brewing Company’s history of targeting young film audiences with its alcohol advertising. The Wolverine comes out July 26—it should ditch it’s partnership with Coors Light beer now. UPDATE: PHAI has submitted a formal complaint to the Beer Institute. Seeking to capitalize on the public’s insatiable appetite for Youtube stunt videos, Kraft Foods has teamed up with Rob Dyrdek, the host of MTV’s Ridiculousness, to market its recently released Lunchables Uploaded line of lunch kits. 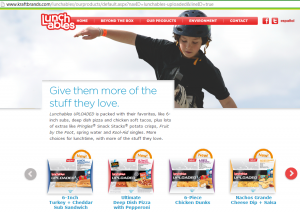 Marketed to parents as a way to “Give them more of what they love,” Lunchables Uploaded kits contain larger portion sizes. In keeping with the product name, Kraft is urging teens to upload videos to be featured on the Lunchables Uploaded website. Kraft produced a series of challenge videos that are emblematic of the types of videos the company is interested in receiving as well as a series of stunt videos featuring Mr. Dyrdek and Lunchables Uploaded products. In the “Terms and Conditions” for its solicitation of user-generated content, Kraft states that entrants must be at least 13 years old to participate and that no prizes will be awarded (other than having a video featured on the website). Eligible participants are told “[w]e [Kraft] made these guidelines so that everyone can have a good time. We don’t want you to break the guidelines. We also don’t want you to hurt yourself while making an Upload. If you do break the guidelines or hurt yourself, it’s your responsibility….” A look at the Kraft-produced challenges and the content it’s featuring on its Lunchables Uploaded website reveals that the company is not committed to following its own terms and conditions with regard to safety. In the “Paper Airplane” challenge, Mr. Dyrdek is first shown throwing a traditional paper airplane inside. He then tells viewers, “You could do it like that. 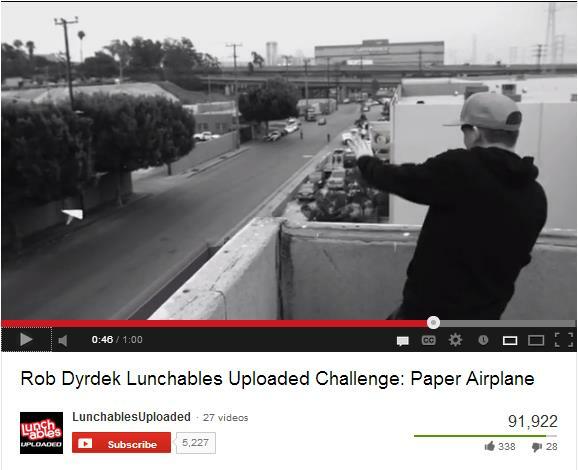 Or, you could upload your plane game.” He is then shown throwing a giant paper airplane off of the top of a building. The video begins by warning viewers not to take unnecessary risks and has over 90,000 views on Youtube. Despite its warning not to engage in unnecessary risks, Kraft is featuring a user-generated video of a man standing on a pitched roof holding large paper airplanes on its Lunchables Uploaded website. Mr. Dyrdek is also featured in a Lunchables Uploaded skateboard challenge. In the beginning of the video he is shown skateboarding without any safety gear–no helmet, wrist or knee pads. He is then shown riding a giant skateboard high off of the ground with no helmet on. 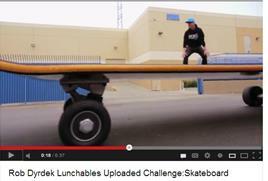 The giant skateboard is comical and Mr. Dyrdek is a professional who was assisted by a production team. Kraft, however,is featuring several videos and still photos of young people skateboarding wearing no safety equipment on its youth-targeted Lunchables Uploaded website. This is in stark contrast to the depiction of a helmeted child on Krafts adult-targeted webpage for Lunchables Uploaded. 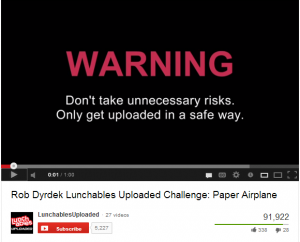 While the terms and conditions on the Lunchables Uploaded website use refreshingly direct language for a legal disclaimer, “[w]e [Kraft] don’t want you to hurt yourself while making an Upload,” the challenge videos and the content they are featuring on the website encourage and reward risky behavior. When teens upload a video or photo, Kraft receives the right to use the content for marketing purposes. When Kraft features the content on its website it then becomes responsible for the content and laws relevant to marketing, including consumer protection laws, must be complied with. The Federal Trade Commission has a history of taking enforcement action when advertisements depict children engaging in risky behavior. In light of the Kraft Uploaded campaign, it might be wise to consider expanding protections for older kids. An article released today in the American Journal of Preventative Medicine by Holman et al. focuses on strategies to reduce indoor tanning. Indoor tanning with sun lamps (as opposed to spray tanning) increases the risk of malignant melanoma, the deadliest form of skin cancer. This is particularly alarming because about one-third of white women(who are a high risk for skin cancer than others) in the U.S. have used sun lamps to tan within the past year averaging about 27 sessions over that time. Many indoor tanning salon users are at even greater risk for skin cancer because 74% of tanning salons fail to adhere to FDA guidelines for tanning frequency. The International Agency for Research on Cancer recently elevated tanning beds to its highest risk category as carcinogenic to humans. Only 2 states prohibit tanning by minors (CA and VT). There are some similarities between the way the indoor tanning and tobacco industries operate. In fact, it appears that the tanning industry may be following the tobacco industry’s lead, particularly in its use of front groups and creating doubt around the science around the harm their products cause. In 2010, the Federal Trade Commission settled a complaint against the Indoor Tanning Association for making deceptive claims about the risks and the benefits of indoor tanning. In addition to legislative approaches to the problem and addressing research needs, one important intervention would be for the Food and Drug Administration to change the medical device classification for sunlamp products from class I to class II. Class I is the medical device class used for tongue depressors. Today, the FDA pre-published proposed rules to reclassify sunlamps as class II devices (they will be published on May 9, 2013 and available here). Class II medical devices include products such as infusion pumps and surgical drapes. Under the rules proposed today, manufacturers would have to: a) demonstrate to the FDA that indoor tanning lamps are safe for individuals; b) adjust UV wavelength to “appropriate” levels; c) install alarms and timers to prevent sunburn; and d) require users to read labels warning them of the dangers of UV exposure, including discouraging individuals under the age of 18 or those with a family history of cancer. Not only will these new requirements improve safety and reduce exposure to UV radiation indoors, they will also provide a strong reason for states to consider passing new or strengthening existing laws regulating tanning salons. A new white paper quantifies the numbers and costs of occupational injuries and illnesses to the U.S. low-wage workforce, and a companion policy brief explains the findings’ importance to policymakers. WASHINGTON, D.C.—Low-wage workers, who make up a large and growing share of the U.S. workforce, are especially vulnerable to financial hits that can result from on-the-job injuries and illnesses, according to a policy brief released today by researchers at the George Washington University School of Public Health and Health Services (SPHHS). The policy brief, “Mom’s off Work ’Cause She Got Hurt: The Economic Impact of Workplace Injuries and Illnesses in the U.S.’s Growing Low-Wage Workforce,” was released along with a white paper showing that such workplace injuries and illnesses cost the nation more than $39 billion in 2010. Leigh zeroed in on approximately 31 million people—22% of the U.S. workforce—in 65 occupations for which the median wage is below $11.19 per hour. Janitors, housecleaners, restaurant workers, and others earning that wage full-time will bring home just $22,350 per year—an amount that means a family of four must subsist at the poverty line. Leigh calculated that in 2010, 596 low-wage workers suffered fatal on-the-job injuries and 12,415 died from occupational ailments such as black lung disease or certain kinds of cancer. Another 1.6 million suffered from non-fatal injuries, and 87,857 developed non-fatal occupational health problems such as asthma. The costs of the 1.73 million injuries and illness amounted to $15 billion for medical care and another $24 billion for lost productivity—the cost when injured or sick workers cannot perform their jobs or daily household duties. The policy brief explains that workers’ compensation insurance either does not apply or fails to cover many of these costs, which can bankrupt families living on the margin. In some cases, employers do not have to offer this kind of insurance to employees. And even workers that do have the coverage often get an unexpected surprise after an on-the-job injury or illness: Insurers generally do not have to provide wage replacement until the worker has lost between three and seven consecutive shifts. And workers at the low end of the wage scale are often discouraged from reporting on-the-job injuries as work-related—which leaves them with no insurance benefits at all, the brief said. Leigh calculates that insurers cover less than one-fourth of the costs of occupational injuries and illnesses. The rest falls on workers’ families, non-workers-compensation health insurers, and taxpayer-funded programs like Medicaid. “When low-wage workers miss even a few days of pay while recovering from an occupational injury or illness, the effects spread quickly,” Borkowski says, noting that fewer than one in five low-wage workers has access to paid sick leave. “They will usually have to cut back on their spending right away, which affects the local economy.” And families with children might skip meals or cut back on the heat, money-saving tactics that can put vulnerable family members such as children at risk of developmental delays and poor performance in school. Both the policy brief and white paper were funded by the Public Welfare Foundation. Today, the Public Health Advocacy Institute (PHAI) at Northeastern University School of Law in Boston, joined by 10 other organizations, sent a letter to the U.S. Federal Trade Commission (FTC) asking that it investigate Merck & Co. Inc.’s Madagascar 3-themed marketing campaign for its flagship pediatric allergy medication, Grape-Flavored Chewable Children’s Claritin®. “Marketing medicine directly to children at all, much less through entertainment tie-ins, is well beyond the pale and is not only inherently unfair, it is downright dangerous,” said Mark Gottlieb, executive director of PHAI. 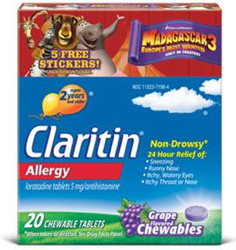 To promote its June release of the Madagascar 3: Europe’s Most Wanted movie, Dreamworks licensed its Madagascar characters to Grape-Flavored Children’s Claritin®. It also licensed the characters to market other children’s foods including fruit-flavored Airheads candy, General Mills (Betty Crocker) Fruit Snacks, and McDonald’s Happy Meals. The use of the same characters on candy and gummy snacks and Children’s Claritin® creates the impression that the medicine is candy and could lead children to over consume the product at great risk to their health. The FTC regulates over-the-counter (OTC) drug marketing and has protected children from marketing of vitamin supplements, and by extension OTC drugs, since 1977 when it found the use of Spider-Man to market vitamins to children to be unfair and deceptive (In re Hudson Pharmaceutical Corp., 89 F.T.C. 82 (1977)). Merck’s campaign utilizes customized Madagascar 3 packaging including “5 Free Stickers.”with Madagascar 3 characters and containing “5 Free Stickers.” Mail-in movie ticket voucher promotions were prominently placed at retail outlets such as Walgreens and downloadable Children’s Claritin® Madagascar-themed activity games further targeted children. Merck also enlisted its “Children’s Claritin® Mom Crew” members to create social media buzz. Mom Crew members held Madagascar-themed viewing parties for children featuring product samples, coupons, DVD’s, popcorn containers and, Madagascar stickers and then featured the children’s parties on their blogs and websites. PHAI, Berkeley Media Studies Group, Campaign for a Commercial-Free Childhood, Center for Digital Democracy, ChangeLab Solutions (formerly Public Health Law & Policy), Corporate Accountability International, Eat Drink Politics, Public Citizen, The Public Good Law Center, Public Health Institute and Prevention Institute request immediate action by the FTC to stop this practice before it becomes widespread. As of November 1, 2010, the Public Health Advocacy Institute is coordinating the Beyond OSHA project in conjuntion with Board member and project Principal Investigator Anthony Robbins, MD, and Celeste Monforton, DrPH, who is the project’s director. The work focuses on enlisting experts and advocates to help workers make better use of their legal rights in the workplace. The Pump Handle, a public health blog moderated by Liz Borkowski, a graduate student at George Washington University’s School of Public Health and Health Service, is a key compenent of this project, which is funded by the Public Welfare Foundation. Beyond OSHA is PHAI’s second injury reduction project, the first one being the Motor Vehicle Hazard Archive Project. Like using law and policy approaches to reduce chronic disease caused by tobacco products or sales and marketing of obesogenic foods and beverages, injury reduction is a cornerstone of public health policy that seeks to reduce preventable morbidity and mortality.